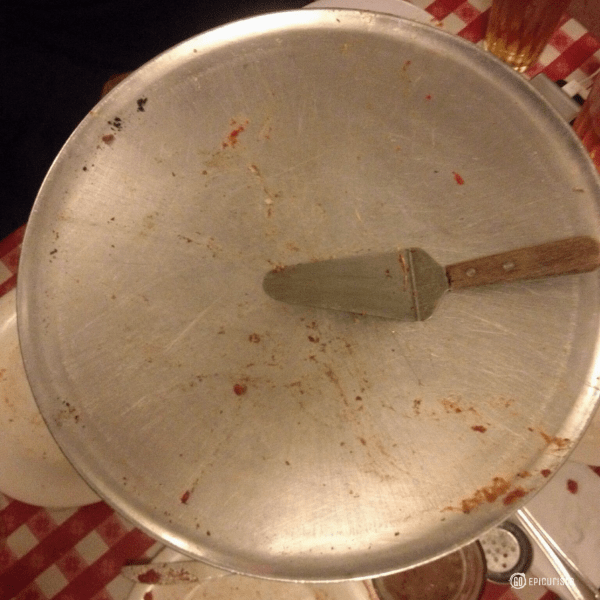 New York is known to have some of the best pizza in the world, therefore, a visit to The Big Apple is not complete without devouring a slice or two of one of these magnificent pies. Don’t get me started on the debate between Chicago and New York pizza and which one is best. In my opinion, they are vastly different and both incredibly good in their own way. Let me tell you where I do draw the line. You may have a favorite “New York Style” pizza in your hometown and it may be called “authentic” because it is made by former New Yorkers. 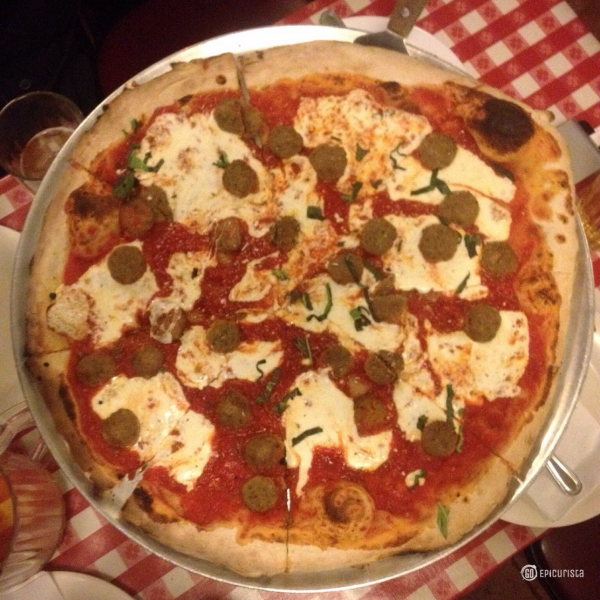 Undoubtedly, it may be very good, yet nothing compares to having the authentic pizza in New York City. End of discussion. The New York pizza experience is like no other. Some say it’s the New York City water that makes it so special and even go as far as to import water in order to make authentic New York pizza. But c’mon. It’s just not the same. 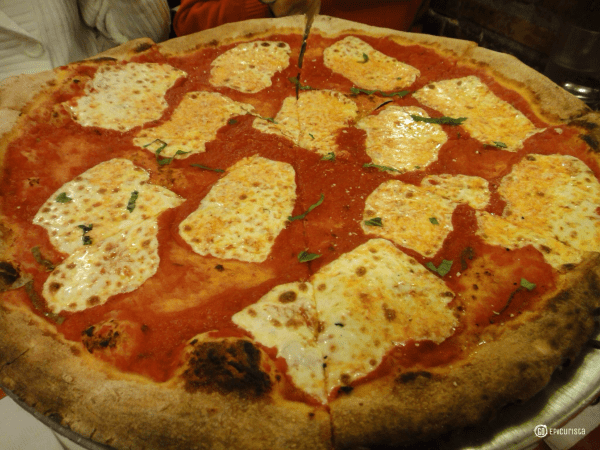 Authentic New York pizza, the Neapolitan way, must include a nice crisp crust from a coal oven, tangy tomato sauce, gooey melted mozzarella cheese, a bit of “fuhhgetaboutit” attitude and grease running down your arm when you pick up that amazing slice. Whether you fold it or not, it is your choice, but don’t say I didn’t warn you about the grease. Nothing like it, I tell you. 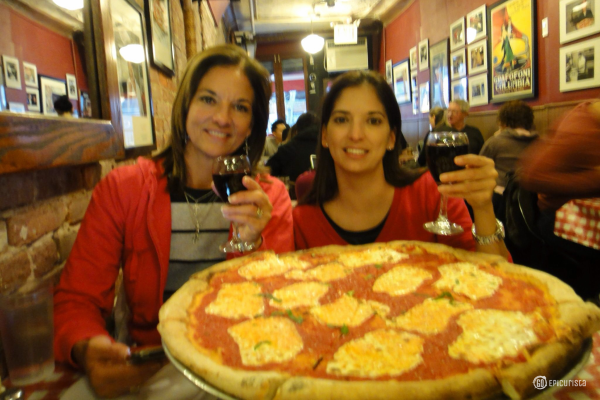 There are quite a few awesome pizza joints in New York City but you never forget your first slice. 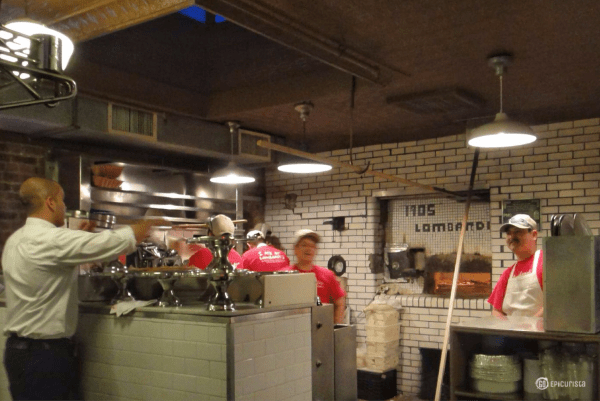 Mine was Lombardis Pizza, which is also likely to be many Americans’ first taste of pizza since it boasts the title of the oldest pizzeria in America, opened in 1905 by Gennaro Lombardi. He actually started selling tomato pies to go from his grocery store as early as 1897. It wasn’t until 1905 when he got a business license to open a restaurant and the rest is history. 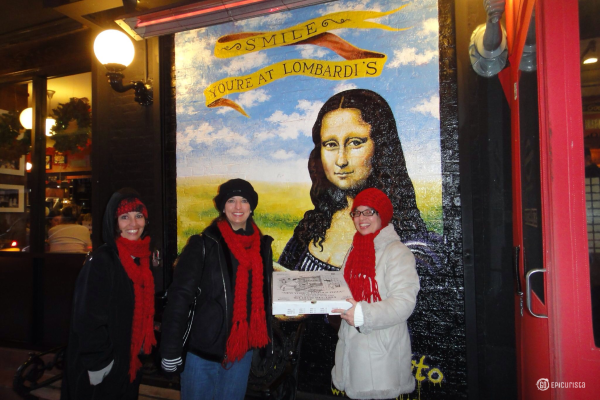 Since then, locals and tourists alike line up to get the famous Lombardi Pizza pies. My first visit was with my sisters during a Girls Getaway Weekend. I planned a “Be a New Yorker” day where we ate all the traditional Must Eat Foods of New York which you can read about in this fun post. Of course, a stop at Lombardis Pizza, due to its iconic status, was in order. 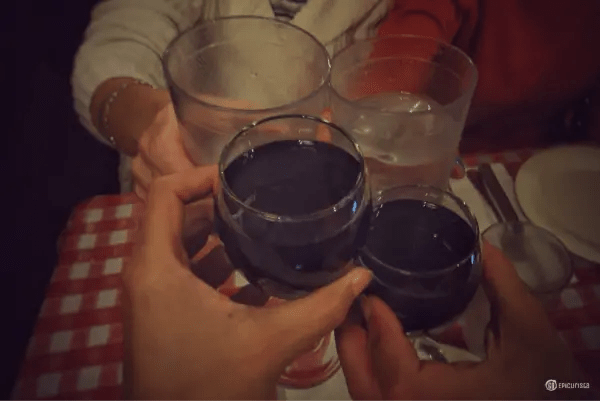 It was a fun night with just the four of us, laughing and sharing stories over cheap wine and a great slice. I’ve returned since then and every time has been a great experience, but you never forget your first. The menu here is simple. You can either get the Original Margherita Pizza, the White Pizza or a Calzone. You can even get half and half if you want different toppings on each side or half Marguerita and half White to sample both styles. They also offer a few other select items on the menu such as salads and Grandma’s Meatballs, but are you kidding me? Who goes and doesn’t order a pizza? Those are add-ons, not instead of’s. The Original Marguerita Pizza is my favorite. A traditional Neapolitan pizza, without much fussing over, with only high quality fresh mozzarella, fresh crushed tomato sauce, Romano cheese and fresh basil, cooked to near perfection in a coal oven resulting in a crisp, slightly charred crust. The crust is what sets New York pizza apart. The coal oven at Lombardis Pizza makes the crust smokey and charred on the outside yet chewy on the inside. On one occasion it was a bit more charred than I prefer but it was still great. Remember, no two pies will ever be alike. These are handmade to order. The cheese will likely come off in one big chewy chunk after you wrestle it into an incredibly long string. Oh, so good I’m drooling as I write this. Plus, you can taste the fresh crushed tomatoes in the sauce with that tangy acidity and a touch of sweetness. Are you drooling yet? You can add assorted toppings such as sweet Italian sausage, spicy pepperoni or homemade meatballs. However, be warned, it can get a bit pricey at $4 per topping. You will not find crazy gourmet toppings or combinations here. My advice is keep it simple. The thin crust can get soggy if you add too many toppings. Pizza pies are sold in either a small with 6 slices or large with 8 slices. They do not sell pizza by the slice, so get some friends together and share a pie. The red and white checkered tablecloths and dark wood furnishings give Lombardis Pizza that traditional Italian restaurant look you expect. A worn-in comfy ambiance where you can just relax. The restaurant looks small, until you are taken to an annex, via the kitchen, a long narrow room with red brick lined walls and an even cozier setting. Getting to see the old coal oven was quite a treat as I was walking by. They say these ovens become seasoned over time. I would say this one was well seasoned! During my visits, our wait for a table has not been long, usually under 30 minutes. They have a bar where you can order wine and cocktails while you wait. If you prefer not to wait, you can order your pizza to go. The wait for your delicious pizza pie can take a bit longer if the place is really busy as each pie is made to order. The service is friendly, in a New Yorker kind of way, and they always made sure we were taken care of. Sorry for that blurry picture. If you’re astute, you may notice that the sister that took the first picture was drinking wine and the sister that took the second picture, the blurry one, was drinking water. In conclusion, drink wine and you will take better pictures! 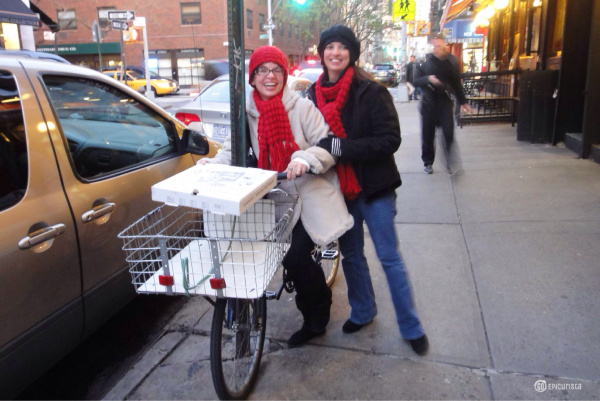 Lots of smiles with Lombardis Pizza. So good, we even took a pie home TO GO! Lombardi’s Entrance and lots of smiles! We almost went on the delivery route but decided against it. Lombardi’s delivers in the area. Everyone in New York City delivers! One last word of advice, don’t forget to bring cash. Annoying in this day and age of credit cards and apple pay but this pizza joint only accepts your hard-earned green paper bills. Lombardi’s Pizzeria is located at 32 Spring Street in the Nolita neighborhood. Read all about the Must Eat Foods of New York City in this blog post as I share my favorite Must Eat Foods from Around the World in the A to Z Blogging Challenge. What’s your favorite New York Pizza joint? Please share in the comments below. Whatever you do, please for the love of all things holy and delicious, don’t miss out on having a slice of pizza on your next trip to New York City. 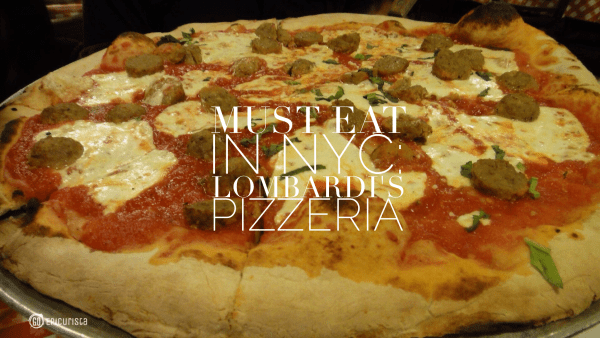 If you’ve never been to Lombardis Pizza, then you must add it to your list and try it at least once. 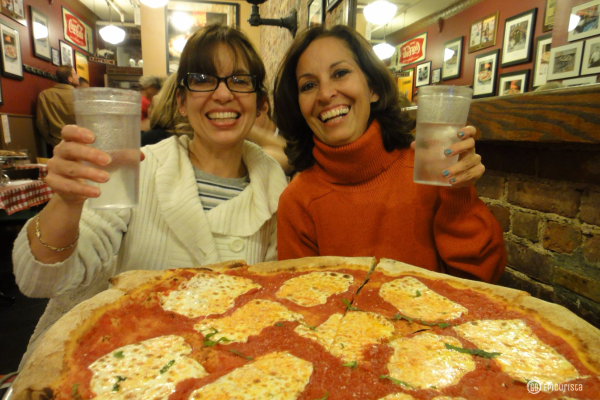 It’s the original pizzeria and it’s even better shared with friends!